Iron Speed Profile - icsbusinessbox, Human Capital Services Ltd.
"This achievement would not have been imaginable without productivity gains afforded by Iron Speed Designer." Human Capital Services Ltd. delivers support in Human Resources and Employment Law, Integrated Business Software Solutions, Recruitment and Talent Planning, Training, and Development and Consultancy. They are an ambitious Business Services company looking to bring innovative automation solutions to the B2B space. icsbusinessbox captures and reports on services required by businesses such as Human Resources, Sales, Time and Billing, and Portfolio Management. Deployed in a multi- module manner, it allows the client to select the modules useful to him. Future icsbusinessbox modules include Course Booking and Recruitment. The application was originally designed for in-house use with the intention to bring it to market. Original users are Thinkshield Ltd. Software Consultants deployed at various client sites requiring a timesheet solution. 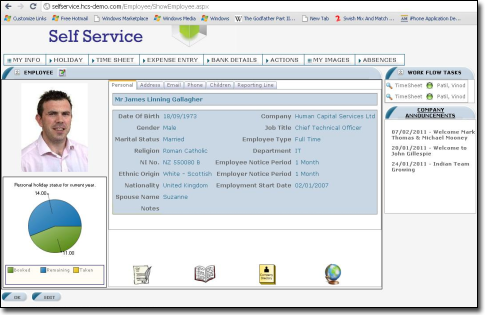 A user is created on the icsbusinessbox system. A username and password are created at the user record creation stage. 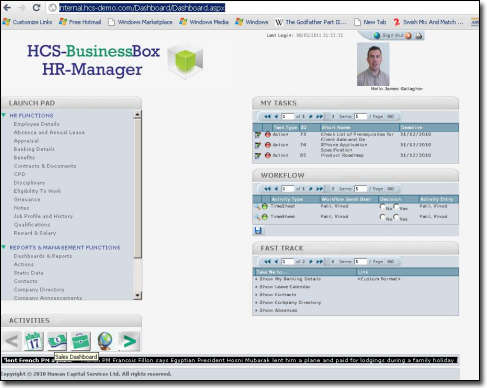 A user logs onto either icsbusinessbox HR Manager or icsbusinessbox Self Service. 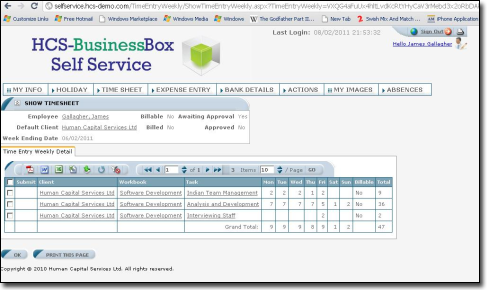 A user is able to access functions on icsbusinessbox depending on his user role membership. Admin/Manager/Director users can create/edit/delete most records. Regular users can view selected record fields but not sensitive fields. A user is able to update personal details on Self Service and/or submit timesheets, expenses, or holiday requests. Admin/Manager/Director users can update details of other users in the enterprise in HR Manager. Users can also look up contact details of other users in the enterprise using icsbusinessbox's Company Directory. Multi-module functionality is achieved in HR Manager by Single Sign-On to HR Manager. Multi-module functionality is achieved in Self Service by role-based permissions applied to menu item selection. We have one database. We used SQL Server and have approximately 440 tables. Our largest table is the Contact and Audit table. The main module has 1,133 pages, Self Service has 200 pages, CRM has 200 pages, and Project Management has 65 pages. Enhancements continue. We have 40 current users per month and estimate over 500 transactions. icsbusinessbox Self Service Landing Page. icsbusinessbox Self Service Landing Page with Company Announcement Pop Up. 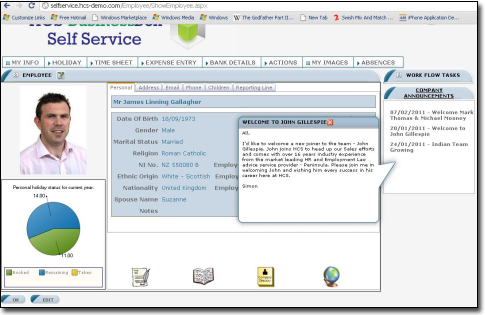 icsbusinessbox Self Service Landing Timesheet Entry. icsbusinessbox HR Manager Landing Page. 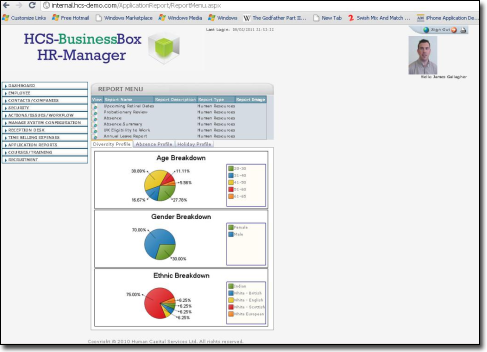 icsbusinessbox HR Manager Reports Page. We had three developers assigned to this project, and it took six months to complete. We estimate that there are approximately 5,000 lines of code in these customizations. We incorporated Infragistics Pie Charts/Bar Charts. Customized baseclasses.dll to substitute database connection details on-fly, depending on client. Validation around submission and workflow approval for timesheet, expenses, and holiday requests. Customized drop-down content to omit ex-employees. We created an application-specific design theme. We spent 24 man months (six months) on this project and estimate that we saved 192,000 GBP ($310,000 USD). It would have taken a minimum of 18 months to complete without Iron Speed Designer. James Gallagher has a Bachelor of Science in Mathematical Sciences, University of Strathclyde, in Glasgow, Scotland. James has 17 years of industrial software industry experience in Microsoft technologies. He is an IT professional and Senior Manager with strong experience in management and development of IT teams across software and infrastructure. As a Technology Product Manager, he led the development and release of a number of complex applications, across industries, including Banking, Television, Defense, and Logistics. Currently, James is the Chief Technology Officer at Human Capital Services — HCS, reporting to the board, with full responsibility for all software, infrastructure, and the technology roadmap of this growing business.